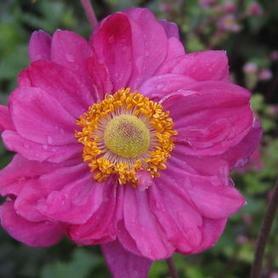 'Lucky Charm' Windflower blooms in September and October, with dark pink single flowers held on dark purple stems. The foliage is a dark green, often with purple and plum undersides to the leaves. Native pollinators and honeybees love the pollen which provides much needed sustenance in fall. 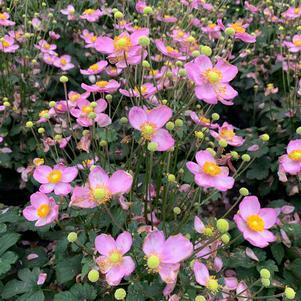 Each plant of Anemone x 'Lucky Charm' will slowly spread to make a compact mounded clump eventually, making it a great candidate for naturalizing in moist shady sites. PRN Preferred: A more compact mound with tons of flowers. 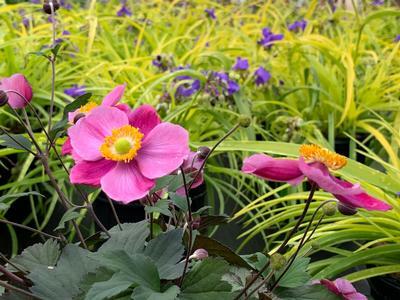 We love that the undersides of the foliage has a purple cast.